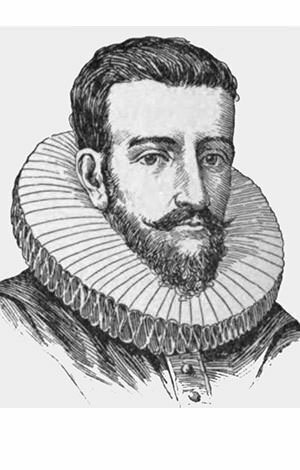 Henry Hudson was an English explorer who was one of the most influential and renowned figures of the Age of Discovery, a term used to refer to extensive European overseas exploration from the end of the 15th century to the 18th century. Hudson undertook four voyages in early 16th century to find a short northerly passage to Asia. Though he never reached his intended destination, he became the first European to explore the Arctic Ocean; and discovered the Hudson Strait and the Hudson Bay in North America. Hudson was a skilled navigator who successfully traversed the treacherous waters of the North Atlantic, rarely losing a crew member. Apart from providing valuable information to future explorers, his discoveries formed the basis for Dutch colonization of the Hudson River and for English claims to much of Canada. 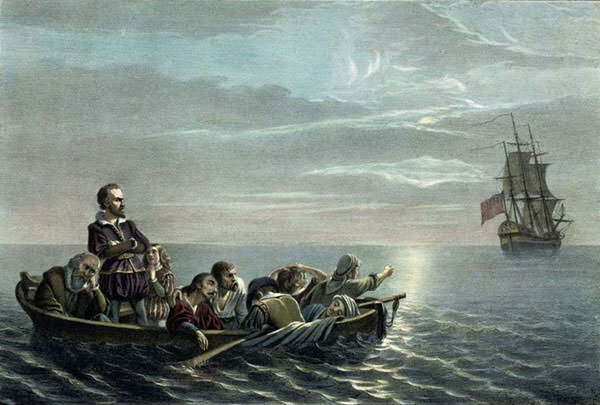 Henry Hudson was marooned in the Hudson Bay after his crew mutinied during his fourth voyage and he was never seen again. 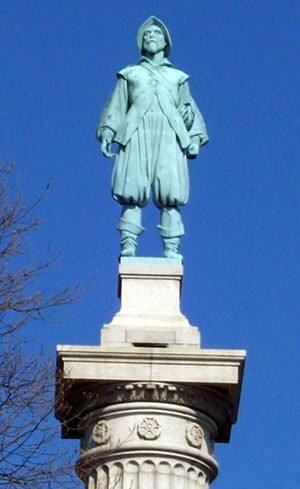 Know more about the family, life, voyages, discoveries and accomplishments of Henry Hudson through these 10 interesting facts. The exact year and place of birth of Henry Hudson is not known. He was probably born in 1565 or 1570 somewhere in England, probably Greater London. Henry Hudson is thought to have been a son of a sea merchant. He is considered to have spent many years at sea in his early life, beginning as a cabin boy and gradually working his way up to ship’s captain. He might have worked under the renowned navigator Captain John Davis and acquired his knowledge of northern regions as well as his sailing and navigational skills from Davis. Henry Hudson married a woman named Katherine, probably in the 1590s. He had three sons with her: Oliver, Richard and John. In late 16th and early 17th centuries, European businesses were looking for a navigable route to Asia over the north pole. Cartographers, or map makers, of the time thought that sun melted the ice at the pole during the summer, which meant that there would be a navigable shorter north-east or north-west sea route from Europe to Asia. 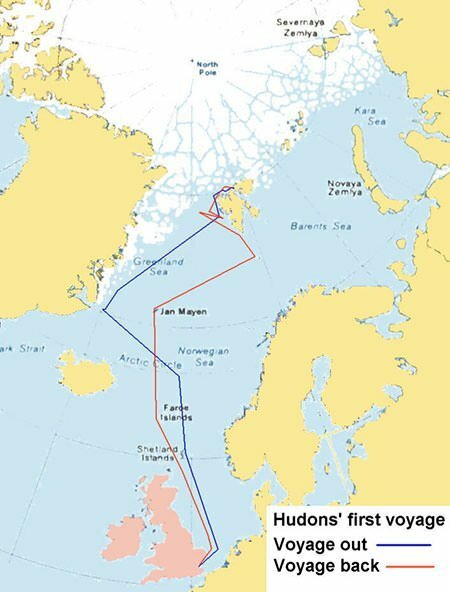 The voyages of Henry Hudson aimed to find an ice-free passage past the North Pole that would provide a shorter route to the rich markets and resources of Asia. In 1607, the Muscovy Company, an English trading company, hired Henry Hudson to find a passage by the North Pole to Asia. On May 1, Hudson set sail from Gravesend on the ship Hopewell along with a crew of 11 people including his 14-year-old son John. They reached the east coast of Greenland on June 14. They then sailed north-east along the coast of Greenland and reached Spitsbergen archipelago in northern Norway, just 700 miles from the North Pole. The polar ice pack blocked their way at latitude 80° 23′ N or 79° 23′ N. No European had ever reached so far north. As ice blocked his way, Hudson was forced to turn back and he returned to Tilbury Hope, England on September 15. In 1608, the Muscovy Company again sent Hudson to find that northerly passage to Asia, this time to the east around northern Russia. Hudson left London on April 22, 1608 aboard the Hopewell. This time his ship travelled almost 2,500 miles making it to Novaya Zemlya, an archipelago in the Arctic Ocean to the north of Russia. However, his way was again blocked by ice fields and he was forced to return, arriving at Gravesend, England on August 26. Though Hudson failed twice to find the fabled northern passage to Asia, he carried out the first European explorations of the Arctic Ocean. In 1609, the Dutch East India Company in the Netherlands employed Hudson to undertake a third north-east voyage to find that route to Asia. 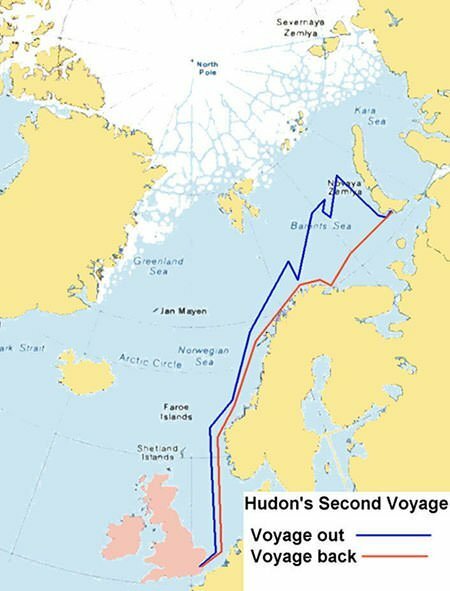 At this point, Hudson had heard of two possible channels to the Pacific across North America, at about latitude 62° N and latitude 40° N. Although his interest in these north-west passages had been aroused, Hudson agreed to return directly to Holland in case the north-east voyage was unsuccessful. He sailed from Holland on the ship Halve Maen (Half Moon) on April 6, 1609. 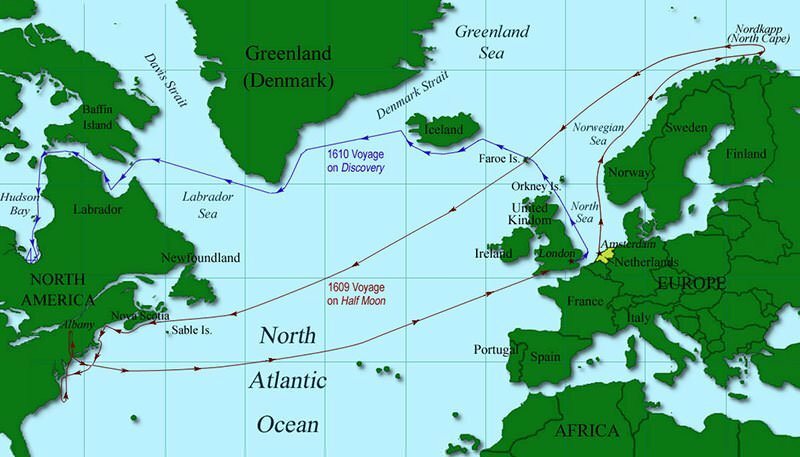 However, when adverse conditions again blocked his route north-east, he ignored his agreement with his employers to return directly and instead changed the ship’s course for North America to seek the north-west passage. After turning west to seek the north-west passage to the Pacific, the Half Moon landed in Newfoundland, Canada on July 2. Hudson’s expedition then travelled south along the Atlantic coast and put into the great river discovered by Florentine navigator Giovanni da Verrazano in 1524. They travelled up the river about 150 miles reaching present-day Albany, the capital of New York. From then on, that river came to be known as the Hudson. Thinking that Hudson River wouldn’t lead all the way to the Pacific, Hudson decided to return to Europe landing on Dartmouth, England on 7 November, 1609. The English authorities seized the ship and forbade Hudson from working with the Dutch again. However, Hudson managed to pass the log to the Dutch ambassador to England, who sent it, along with his report, to Amsterdam. Hudson’s expedition was used by the Dutch to establish claims to the regions he explored. They colonized the region, establishing the colony of New Netherland, including three major fur-trading outposts: New Amsterdam, Wiltwyck, and Fort Orange. 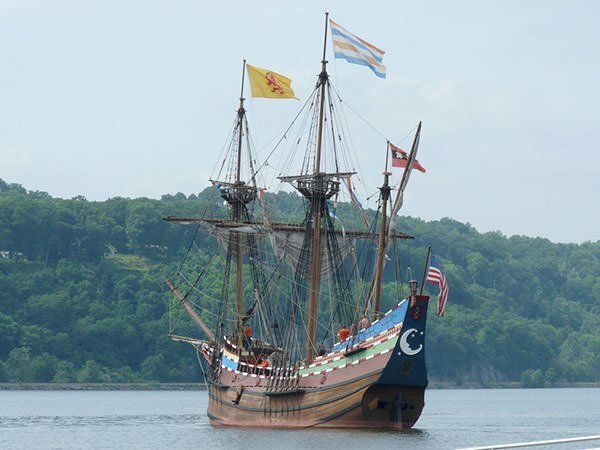 In 1610, the Virginia Company and the British East India Company sponsored the fourth and final voyage of Henry Hudson. He set sail from London in the ship Discovery on April 17, 1610 in an attempt to find the north-west passage to Asia. The Discovery sailed across the Atlantic reaching Iceland on 11 May and the south of Greenland on 4 June. It then circled the southern tip of Greenland and on June 25, entered a strait at the northern tip of Labrador which became known as the Hudson Strait. 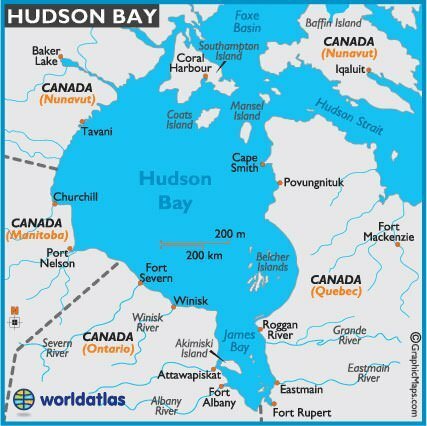 After sailing through the Hudson Strait, Henry Hudson believed he had found the Pacific but in fact he had sailed into a gigantic bay, now known as Hudson Bay. He continued to sail southward along the bay’s eastern coast until he reached its southernmost extremity at James Bay, between northern Ontario and Quebec. As Hudson hit a dead end at James Bay, harsh winter conditions set in and supplies ran low. Crewmembers grew restless and hostile; and tensions began to build. It is said that Hudson hoarded rations for his favourites further increasing resentment among the crew. As the expedition began heading back to England, the crew of Discovery mutinied. The mutineers seized Hudson, his son John, and 7 others and cast them adrift in Hudson Bay in a small open boat on June 22, 1611. No more was ever heard of Henry Hudson again. Only 8 of the 13 mutinous crewmen survived the return voyage to Europe with the others being killed in a fight with Eskimos. Some of those who returned were put on trial but were acquitted. The narrative of the mutiny was told by ship’s navigator Abacuk Pricket. He alleged that the mutiny was led by Henry Greene and Robert Juet. However his version is doubted by many as the two men didn’t survive the return journey and it would be in the interest of the survivors to put the blame on men who were not alive to defend themselves. Henry Hudson commanded four voyages that never reached their destination. However he is still one of the world’s most famous explorers. Travelling by sea was extremely dangerous in the early modern era and Hudson twice sailed into the treacherous waters of the North Atlantic laden with dangerous icebergs. This is considerable evidence of his expertise as a navigator. On top of that, he didn’t lose a single member of his crew during these expeditions except a man killed by Native Americans. Thus, if keeping a crew alive is a measure of a captain’s ability, then Hudson had an exemplary record. He also wrote detailed accounts of the dangers posed by icebergs, the location of marine resources such as whales and seals, and expert advice about what it would take to survive in northern waters. These proved to be very beneficial to future explorers. However, Hudson was also said to be headstrong and to have played favourites which might have affected the morale of his crew and probably caused the mutiny which led to his ultimate demise. The discoveries of Henry Hudson formed the basis for the Dutch colonization of the Hudson River and for English claims to much of Canada. The Hudson’s Bay Company of England controlled fur trade through much of North America due to his discovery of the region. It became so powerful that it influenced the history of the area. Also, Henry Hudson contributed significantly to geographical knowledge. Three of the most noteworthy bodies of water in North America, the Hudson River, Hudson Strait, and Hudson Bay, are named after him. Apart from these other places named after him include Hudson County in New Jersey, the Henry Hudson Bridge and the Henry Hudson Parkway in New York City, and the town of Hudson in the state of New York. I got an A on my final project for the year thanks to this website. I really appreciate it. I need to cite this cite can I have some information? Learnodo Newtonic is part of Turiya Infotainment Private Limited, a company based in New Delhi, India. I hope that helps. Thank you for really interesting and accurate information! Your site is awesome! Cool facts love it. I need more facts though! Just found out I am related to Henry – 11x Great-Grandfather. Neat stuff! Thank You for your information.